The Huntington Library, Art Collections, and Botanical Gardens is a collections-based research and educational center founded in 1919 by railroad magnate Henry Edwards Huntington on the grounds of his private estate near Los Angeles, California. Two art galleries and a library showcase magnificent collections of rare books, manuscripts, and European and American art. Surrounding them are 120 acres of breathtaking botanical gardens, where some 15,000 varieties of plants are displayed in a dozen principal garden areas, including themed landscapes devoted to the plants and horticultural traditions of China and Japan. 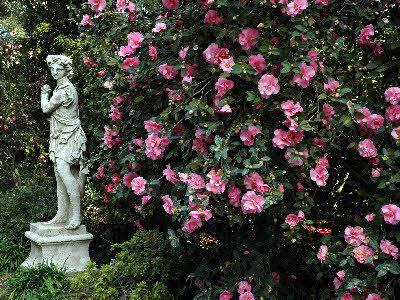 The botanical collections at The Huntington include nearly 80 different camellia species—sasanqua, japonica, reticulata, hiemalis, vernalis, tunghinensis, nitidissima, and semiserrata, to name just a few—and some 1,200 cultivated varieties. What makes the collection stand out is not only its size and completeness, but also to the number of rare and historic cultivars it contains. The descendents of some of the earliest camellias to arrive in England from Asia in the 18th century are represented here, including Camellia japonica ‘Alba Plena’ and C. ‘Captain Rawes’. The most historic individual plant in the collection is C. japonica ‘California,’ which is believed to be the oldest camellia on record in Southern California. This specimen arrived on a tramp steamer as an unnamed seedling in 1888, and had two previous homes before being donated to The Huntington in 2003 by the son of noted camellia collector Ralph Peer. The collection’s reputation as one of the most comprehensive in the world is due in large part to the work of William Hertrich, who was superintendent of the gardens from 1903 to 1948. Hertrich started growing camellias from seed in 1912 as rootstock for grafting new cultivars to expand the collection. Many notable new introductions were made over the years, and one of them—C. reticulata ‘William Hertrich’—was named in his honor. The collection continues to grow. New plantings of reticulata camellias—first introduced into the West from China’s Yunnan Province in 1948—can be seen in and around the Chinese Garden, a tribute to their native roots and to the role of the flower in Chinese culture. 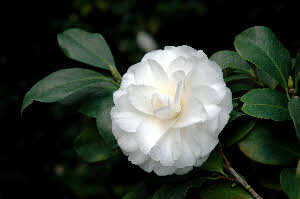 In addition, species camellias from China and other Asian countries are being test-planted. These species, with atypical characteristics such as fragrant blossoms and low horizontal growth patterns, are of great interest to hybridizers, providing pollen and seed for cultivating new and unusual varieties. There are admission charges, see website for details.